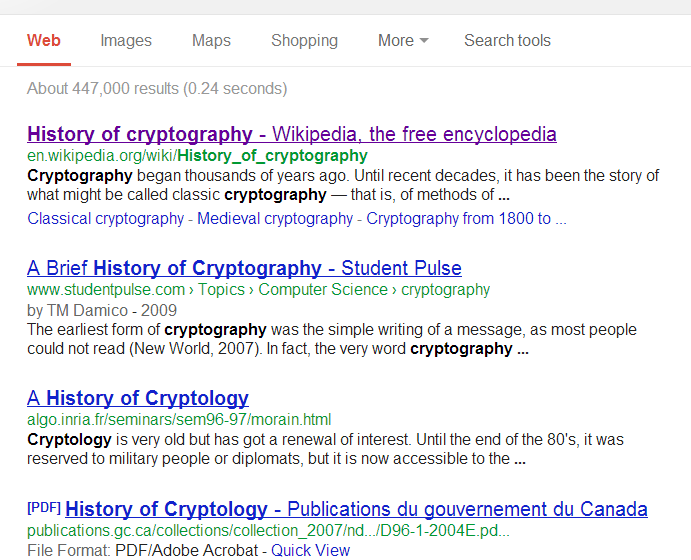 I Googled “cryptology” instead of “cryptography” because I don’t know what I’m doing any more. There seems to be some confusion in terms, anyway. 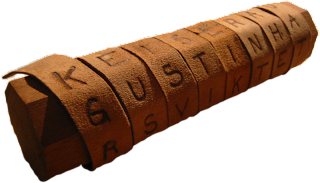 1) The oldest known attempt at encryption dates back to the kingdom of Egypt, about two thousand years before Christ. The ciphers are found on the tomb of Khnumhotep II. They may have been created as a joke, or in an attempt to construct an air of mystery around the tomb itself. 2) By 500 years before Christ, the ancient Greeks of Sparta had developed a device called a scytale, which they used to exchange encrypted messages. Both the sender of the coded message and its recipient had to have one. The scytale consisted of a stick around which a strip of leather or parchment was wound. The sender wrote his message on the wound-up paper, so that when the strip was unwound, it wouldn’t make sense. The receiver had to re-wrap the strip around his own scytale, which had to be of the exact same size and length as the other guy's, in order to decode it. That's the Roman alphabet! I call shenanigans! 3) The next big breakthrough in encryption came in the 9th century, from Arab mathematician Al-Kindi. 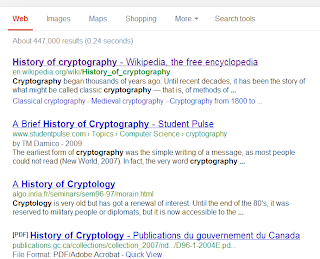 His book, On Deciphering Cryptographic Messages, introduced the field of cryptanalysis, or code-breaking. He introduced code-breaking techniques for substitution ciphers using single and multiple alphabets, as well as introducing different types of encryption and discussing the Arabic language’s encryption potential. Other scholars of the medieval Muslim world produced work on cryptography and frequency analysis, the study of the frequency of letters and groups of letters in a cipher, but much of it has been lost. "Father of lookin' freakin' creepy," if you ask me. 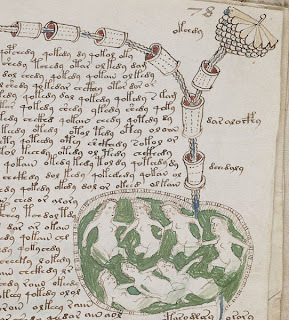 5) One of history’s most inscrutable manuscripts, the Voynich manuscript, is believed to be a complicated cipher. It dates from the first part of the 15th century, and is likely Italian in origin. 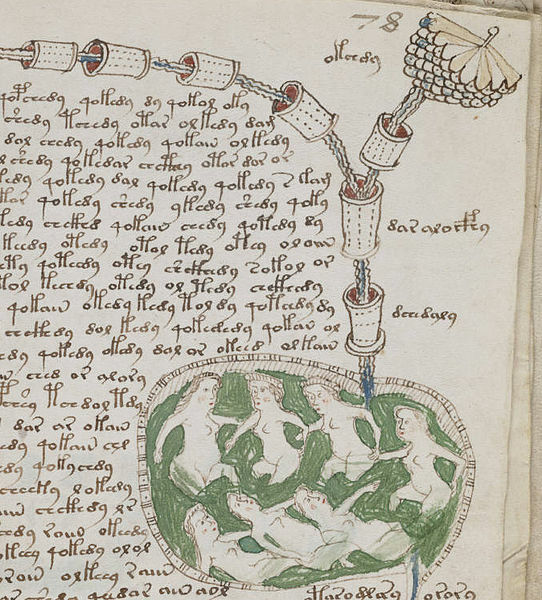 It takes its current name from Wilfrid Voynich, a book dealer who acquired it in 1912. Since 1969, the book has resided in the Beinecke Rare Book and Manuscript Library at Yale University. 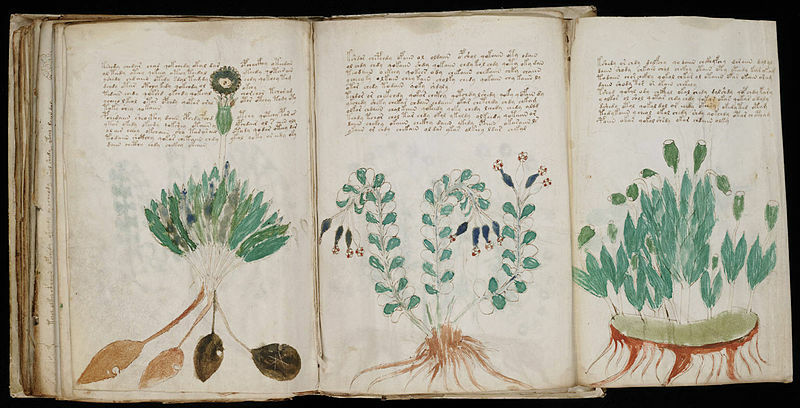 Two hundred and forty pages of the Voynich manuscript have survived to the modern day, although there are clearly some pages missing. Evidence suggests that the original manuscript had about 272 pages, and that they were probably in a different order. 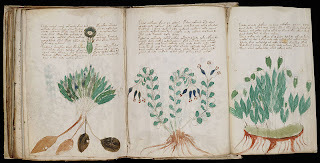 The manuscript includes numerous illustrations of plants, making it resemble a medieval treatise on the medicinal uses of herbs. 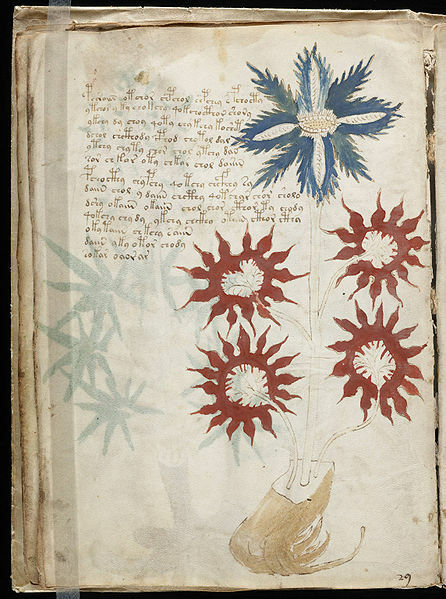 However, none of the plants pictured in the manuscript are known to exist. Not that you can tell because it looks like they were drawn by a toddler. The text of the manuscript is completely incomprehensible, despite efforts by some of the world’s best codebreakers, including some who served the Americans and British during both World Wars. The text was written from left to right, and uses an alphabet of 20 to 30 commonly repeated glyphs, with a few rarer ones sprinkled throughout the manuscript. The glyphs appear to be arranged into words, most of which are no longer than ten characters, and few of which are shorter than three characters. The text exhibits the characteristics of a language that evolved naturally. The strange alphabet resembles the Greek, Cyrillic or Latin alphabets, in that the characters are always written in the same fashion no matter where they appear in the “word.” In some places, the same “word” appears two or three times in a row. The symbols appear similar to the commonly used alphabets of contemporary Europe, but the words make no sense in any of those languages. The smooth flow of the handwritten text suggests that its author was familiar with writing in this language, or that the manuscript was copied from another source. The earliest known owner of the book was Rudolf II, Holy Roman Emperor, who lived from 1552 to 1612. 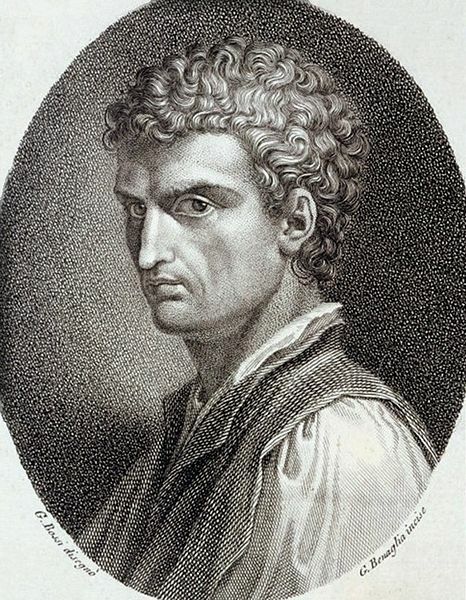 Rudolf passed the book to Jacobus Sinapius, head of the imperial botanical gardens. It then found its way into the possession of alchemist Georg Baresch, who had no idea what it meant, but refused to surrender it to scholar Athanasius Kircher, who got it anyway after Georg’s death. 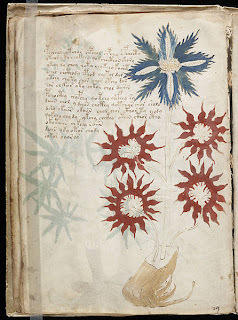 After Athanasius’s death, the book remained with his things at the Collegio Romano until 1912, when the university, short on funds, decided to sell the manuscript, along with others, to Voynich. No one, of course, knows who created the manuscript, although one theory speculates that the book was a hoax created to swindle the aforementioned Emperor Rudolf out of the equivalent of what would today be $80, 831.20 US. More than a hundred years before said Emperor's birth. Sure. I used your article as source for my school paper. Can I cite this and put the website in the source part?